Labor Secretary Tom Perez potentially ran afoul of the law by coordinating with Hillary Clinton’s campaign chairman using his official government email account during the workday, according to emails obtained by Wikileaks. Perez exchanged emails with Clinton campaign chairman John Podesta on December 3, 2015, just hours before the campaign released his endorsement statement. Podesta emailed Perez asking him for his personal account at 10:25 a.m. Perez responded with his personal contact, adding "Can we catch up for a few minutes today?" The two agreed to a phone call at 11:45 a.m., according to the emails, which were hacked from Podesta’s account and posted on Wikileaks. The U.S. intelligence community has formally accused the Russian government of carrying out the hacks in order to influence the presidential election. The Hatch Act prohibits public officials from engaging in partisan or political activity on government time. The law is specifically directed at the use of government email addresses and resources. "A federal employee cannot send or forward a partisan political email from either his government email account or his personal email account (even using a personal device) while at work," an Office of Special Counsel advisory on the Hatch Act says. The emails were sent less than an hour after Perez attended a meeting of the President’s Trade Council where he endorsed the Trans-Pacific Partnership, a trade deal that has been criticized by labor unions and both presidential candidates. He also posted a personal blog post on the Department of Labor’s website that day. Perez and Podesta did not return requests for comment about whether or not Perez was on duty during the time. Matthew Whitaker, executive director of the government transparency watchdog Foundation for Accountability and Civic Trust, said that the emails could indicate that Perez violated the Hatch Act. He noted that department heads and cabinet secretaries "don't necessarily have strict office hours" compared to average federal employees. "Its obviously indicative of a Hatch Act violation–it appears that he was engaging in political activities with government resources (email, phones, building)," Whitaker told the Washington Free Beacon in an email. The House oversight committee revealed in 2013 that Perez used his personal email account to conduct government business in violation of federal record keeping laws. Perez admitted to 34 individual violations. 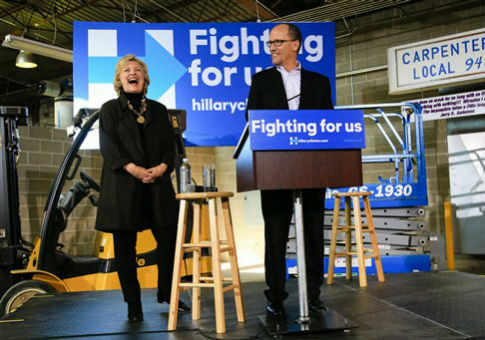 Perez left Washington, D.C., and joined Hillary Clinton in Iowa to address her supporters on December 4. Perez’s endorsement was seen as a major event when it was first announced because of his close ties to one of Clinton’s rivals, former Maryland Gov. Martin O’Malley. O’Malley appointed Perez to run the Maryland Department of Labor, his springboard to statewide and later national politics. Clinton later considered Perez as a potential vice presidential choice before picking Virginia Sen. Tim Kaine (D.). This entry was posted in Politics and tagged Hillary Clinton, Tom Perez. Bookmark the permalink.